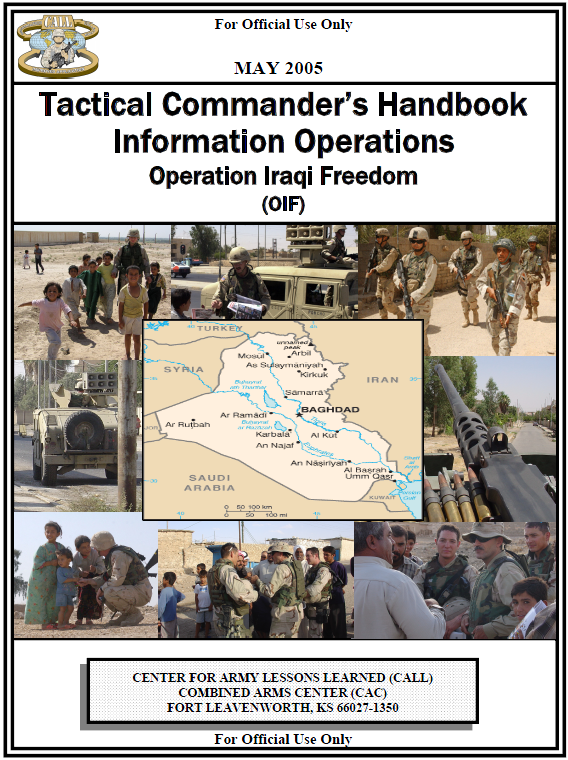 This handbook provides the tactical operator, commander, and battle staff with information on planning, executing, assessing, and sustaining information operations (IO). The handbook is based on observations collected in Iraq during July and August 2004 by an IO collection and analysis team (CAAT). The application of this tool is both for training and real-world events the Soldier may encounter in the Iraqi area of operations. Because Soldiers are primarily warfighters, this handbook emphasizes those concepts key to operational planning for conflict. 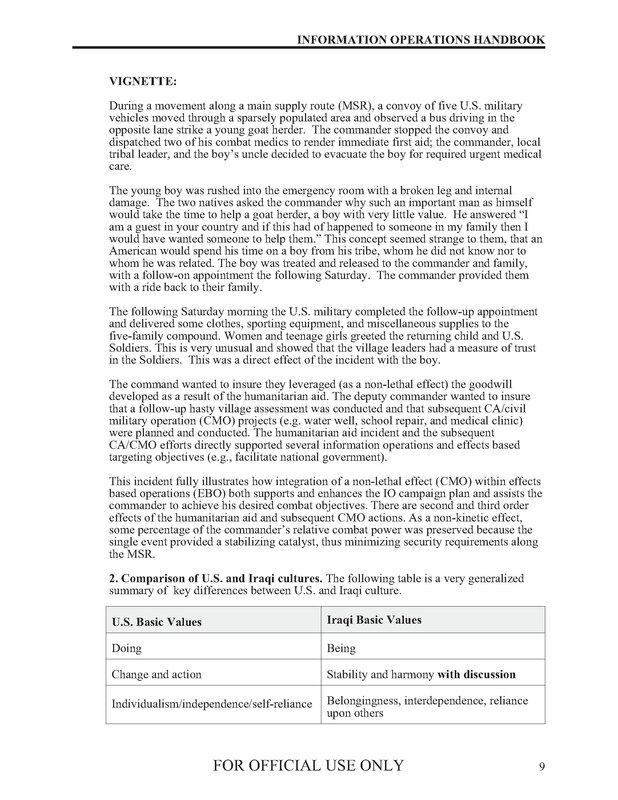 It provides a basis for Soldiers to understand the relevance of information operations and a planning framework for the implementation of information operations. Effective IO first requires specific information products on the adversary’s military (C2, intelligence, and capabilities), social, religious, and economic background that may have to be provided by exercise planners. The data needed to create, update, and use these products needs to be built into the exercise scenario and master scenario events list. Secondly, the opposition force should have an IO capability consistent with the exercise scenario. Realistic IO are essential to evaluating friendly IO. Finally, consistent with the tenets of the exercise, free play of IO must take place by both Blue and Red forces. Pre-structured, mechanical IO will degrade the participant’s ability to gain valuable experience from the demands of mental agility and creativity that unstructured IO can provide. Senior exercise participants should allow, even welcome, the C2 chaos that effective IO can cause to the exercise participants, and work through such problems. Determining required IO information and how to get answers. Identify the commander’s IO critical information requirements, priority intelligence requirements (PIR), and high-priority targets and synchronize intelligence and information plans and military plans on a near-real-time basis. Establish information-linked strategic, operational, and tactical collection, fusion, and report processes (incorporating reconnaissance, surveillance, and target acquisition [RISTA]/sensor and counterintelligence [CI]/human intelligence [HUMINT] data) to develop continuous, timely IO intelligence preparation on the battlefield (IPB). Knowing your IO capabilities and vulnerabilities in relation to the enemy, the natural environment, the political setting, international law, and so forth. Identify and prioritize IO essential elements of friendly information (EEFI). Knowing enemy IO capabilities and vulnerabilities. Maintain a continuous IO estimate of potential adversaries and/or other operational situations in support of IO situational awareness and battlefield visualization. Assess adversary command, control, communications, computers, and intelligence (C4I)/C2W operations, strengths, and vulnerabilities continuously. Knowing how the enemy sees your capabilities and vulnerabilities in terms of IO, the battlefield, and PIR. Understand the enemy’s decision-making process. Identify the enemy’s critical IO nodes. 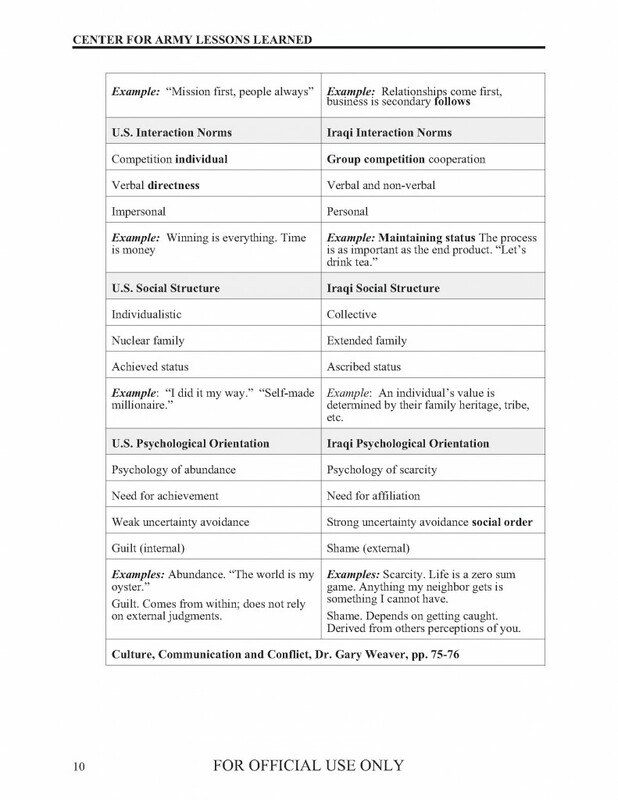 Develop enemy leader personality profiles. Understand the enemy’s decision-making doctrine, tactics, and standing operating procedures (SOPs). Protecting critical and vulnerable friendly IO. Establish open-source processes to obtain, process, provide, secure, and release critical IO information, including PA, CA, governmental, and nongovernmental information, within legal and policy constraints. Establish and maintain critical, secure, intertheater/intratheater military communications and computer networks that support IO: for example, digitization, radar communication processor (RCP), situational awareness, battlefield visualization, distribution, and C2 across the battlespace. Assess friendly C2 vulnerabilities and C2; protect operations continuously and adjust to maintain C2 effectiveness. Achieve C2 protection in support of data integrity and infrastructure protection, IO/C2 node protection, spectrum superiority/control, and graceful degradation. Establish procedures to regain information dominance when it is discovered that the enemy has achieved information dominance. Attacking critical enemy IO vulnerabilities. Establish C2-attack targeting and battle damage assessment (BDA) and establish links to expedite dissemination of adversary information, to include timely sensor-to-shooter links. Attack, deny, degrade, exploit, and/or influence adversary C4I/C2W capabilities or other operations using lethal and nonlethal means.